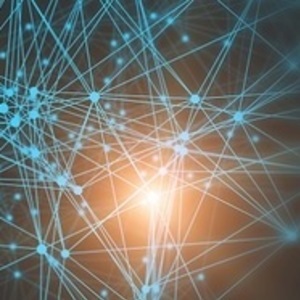 The latest Linked Open Data (LOD) Cloud has been recently made available by the Insights Centre for Data Analytics. 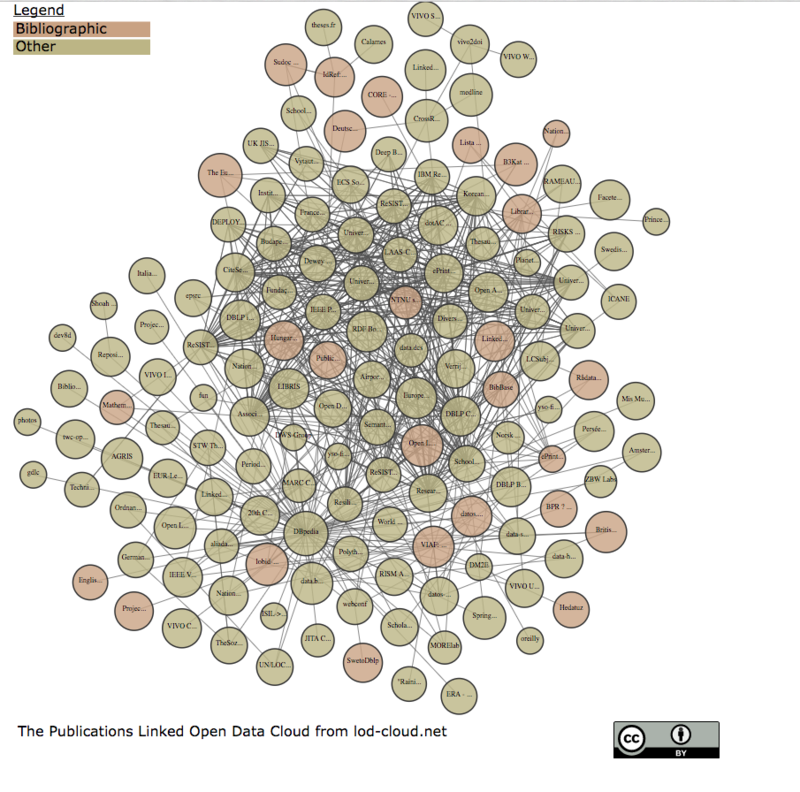 The LOD cloud is a visual representation of the datasets (and the links among them) that have been published according to the Linked Data principles - a web-friendly methodology for data sharing that encourages open schemas and data reuse. We've very glad to say that SN SciGraph is now part of it! (ps this is its JSON record) If you look at the picture above, the two red lines departing from our 'bubble' indicate that the two main datasets we are linking to are CrossRef and DBpedia. 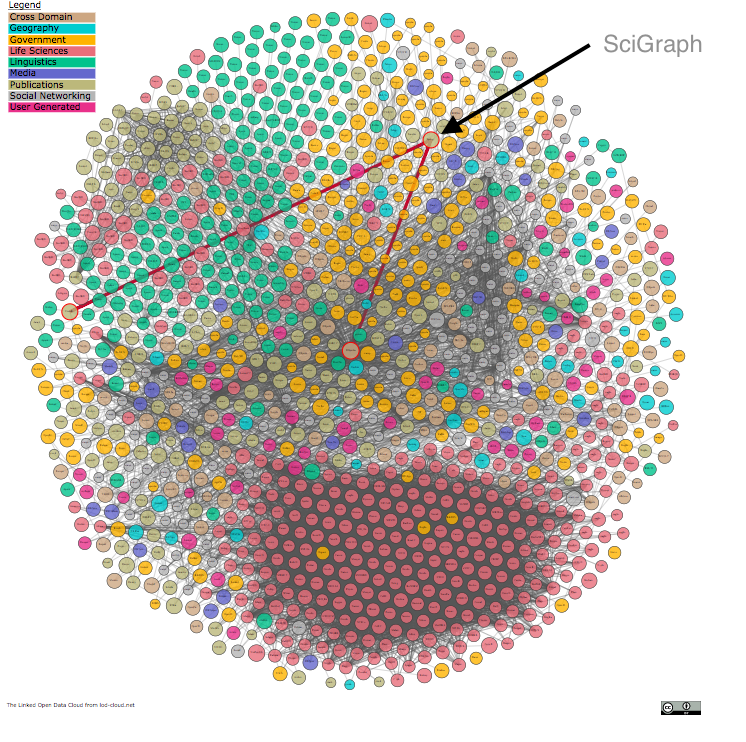 Note this visualisation unfortunately doesn't do justice to the fact that SN SciGraph is one of the largest datasets out there (1 billion + triples and counting). In previous versions, the bubble's size would reflect how large a dataset is.. but hopefully that'll change in the future! The cloud currently contains 1,184 datasets with 15,993 links (as of April 2018) and it's divided into 9 sub-clouds based on their domain. SN SciGraph is part of the 'Publications' sub-cloud (depicted above) alongside other important linked data publishers such as the British Library, the German National Library, the Open Library, OCLC and many others. It's impressive to see the growing number of datasets being released using this approach! We do hope that more discovery tools will be made available that allow searching for data publishers, so to make it easier for people and projects to collaborate.